As it turns out, the storm took more of a toll on Anthem of the Seas than just the cosmetic damage that was shown in passengers’ photos. It damaged the podded propulsion system, causing one of the pods to be shut down as a precautionary measure on the return trip to Bayonne. The Coast Guard said that during the storm all four clutches on the port side Azipod were burned out. As Koningsdam’s April delivery draws closer, Holland America is showing us more and more of the ship. In the fifth installment of their video series, Countdown to Koningsdam, SVP of Guest Experience and Product Development, Michael Smith, shows us the main dining room, which like most of the interior spaces were created by hospitality architect Adam Tihany. Now there’s a cruise ship in your pants, or your purse, or wherever you keep your cell phone or tablet. Carnival’s German brand, AIDA, has updated the webcam concept. When webcams first came out they were addictive because you could tell where each ship was and look at the view from the bridge. You still can, but it has been around for a long time and just about every ship has it. In their new mobile app, AIDA has taken that concept and revived and expanded it. They made it mobile, and now you check in with what’s going on in lots of places on the ships 24/7. The complete story appeared in the February 11 edition of Cruise News Daily. Carnival Cruise Line opened a block of sailings that now has their entire fleet open for sale through April 2018. Details appeared in the February 11 edition of Cruise News Daily. The Klondike Gold Rush did much to shape Alaska’s history. If you take one of Holland America’s Yukon+Denali Land+Sea Journeys this summer, Holland America has a special promotion that could help shape your history. The complete story appeared in the February 10 edition of Cruise News Daily. Valentine’s Day is coming and that’s the time of year people think of getting serious about relationships ... and chocolate. It’s also the time of year when cruise lines think about partnerships ... and chocolate. 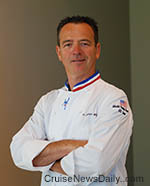 And that is why it’s the perfect time for MSC Cruises to be announcing their partnership with noted chocolatier and pastry chef, Jean-Philippe Maury. Details appeared in the February 10 edition of Cruise News Daily. Photo courtesy of MSC Crociere. All rights reserved. May not be copied or used without permission. The complete story appeared in the February 9 edition of Cruise News Daily. Rendering courtesy of Seabourn Cruises. All rights reserved. May not be copied or used without permission. Royal Caribbean slowed down Anthem of the Seas' return to Cape Liberty today, so it will arrive later on Wednesday. Royal Caribbean declared a quarterly dividend of $0.375 per common share. We have the fourth episode below of Holland America's Countdown to Koningsdam video series. 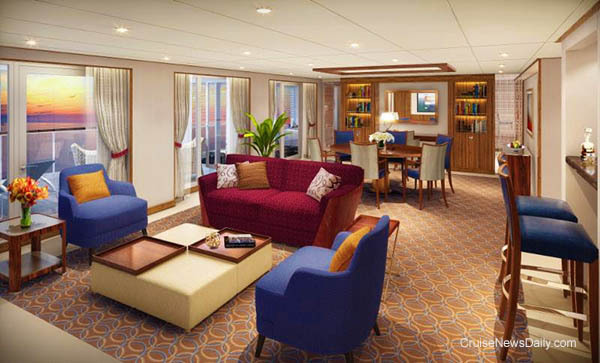 This one previews the staterooms, including new specialty types. Details appeared in the February 9 edition of Cruise News Daily. Royal Caribbean’s Anthem of the Seas left Cape Liberty (Bayonne, NJ) Saturday on a seven-night cruise bound first to Port Canaveral and then the Bahamas. But Sunday afternoon, off the coast of Cape Hatteras (NC), the ship ran into a storm that grew more intense than predicted, and it began to batter the ship. Royal Caribbean made the decision to return the ship to Cape Liberty early. Arrival is planned for Wednesday morning. Details appeared in the February 8 edition of Cruise News Daily. Today is Chinese New Year. It is an ancient New Year tradition in China that cruise lines take their newest ship under construction and flood the dry dock. If the ship floats, it’s good luck and the sign of a prosperous year to come. 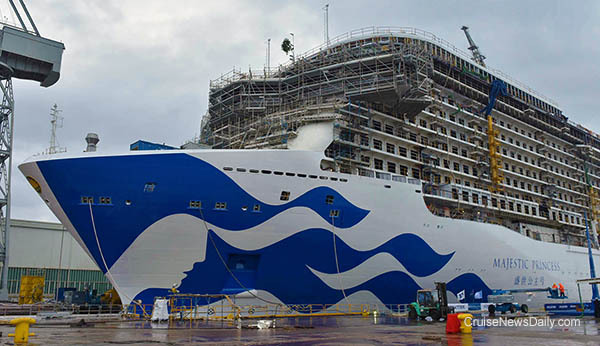 For Princess Cruises, this will be a very good year, because this morning at the Fincantieri yard they flooded the dry dock, and Majestic Princess floated. Not only that, but it carried a surprise for the rest of the world. It is the Princess ship which will introduce the line’s new livery to the world. 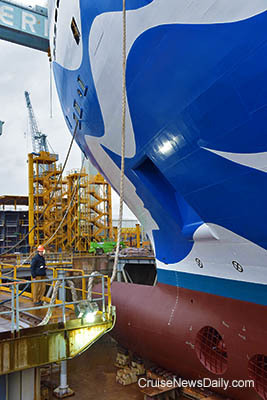 The complete story appeared in the February 8 edition of Cruise News Daily. 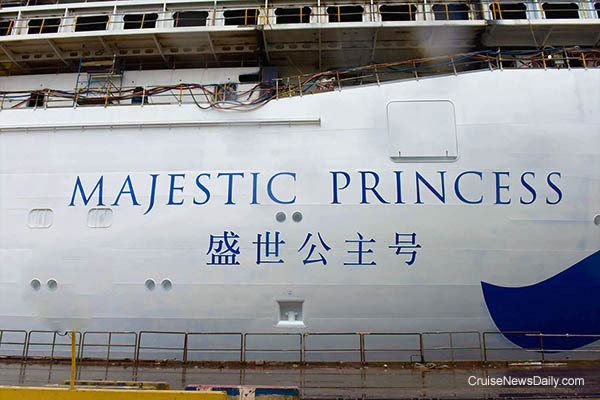 Majestic Princess will be homeported year round in China. Water begins to get the floor of the dry dock wet.